We went to some of the top hair colorists in the country to get tips on how to chalk your hair. If you have black hair, you’ll want to use vibrant shades of chalk to make the color stand out. Rick Wellman is widely recognized as one of the most talented and innovative colorists. His experience spans more than 20 years, during which time he has become a key figure in the world of hair coloring. In 2007, Wellman teamed up with stylist Patrick Melville to open the Patrick Melville Salon at Rockefeller Center where they now welcome a loyal clientele including: Brooke Shields, Mariska Hargitay, Harry Connick, Jr. and Catherine Zeta Jones among others. Wellman offers these tips for chalking black hair. Shampoo hair with a clarifying shampoo. Skip the conditioner. Towel dry and comb out tangles. Hair chalking on dark black hair is a fun way to give strands an artistic, temporary color kick. Pick one or more vibrant colors of soft pastel chalk from your local art supply. Apply chalk heavily to selected damp strands focusing near the ends in an artistic fashion where desired. Steer away from hair chalking at the root or scalp. Allow to air dry. Do not blow dry, as that will blow chalk off of strands and into the air. Once hair is 90 percent dry, seal chalked strands with a hot flat iron several times until completely dry, locking chalk onto the hair. Now you are ready to go out for the weekend and flaunt you locks, but make sure to avoid getting caught in the rain and wearing white. Cobalt blue chalk looks crazy exotic on dark pigments. Hair chalking on dark black hair will only last two to three shampoos at most. 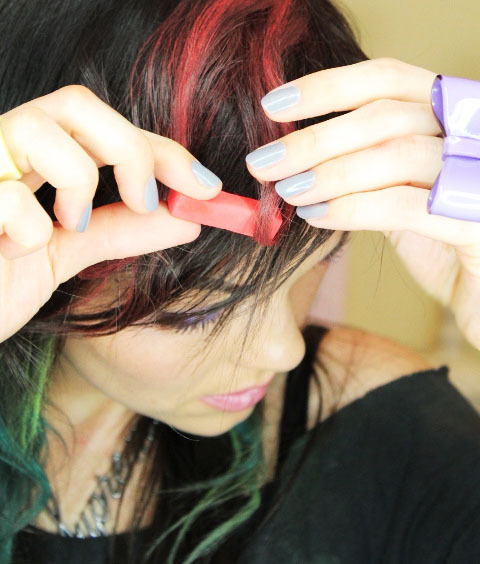 Check out Kandee Johnson‘s video tutorial on how to get into the hair chalk trend. Kandee has black hair and her chalking looks fabulous.